Order your Positive Grid PDST111 BIAS Distortion Twin Effect Pedal from AMS and enjoy 0% Interest Payment Plans, Free Shipping, Free Extended Warranty & 45 Day Money Back Guarantee. The new BIAS Twin series pedals pack all the DSP horsepower you've come to expect from Positive Grid into a pedalboard-friendly footprint. Why buy just one boutique overdrive or distortion pedal when you can have ALL of them? With Positive Grid's Tone Match technology, you can easily match your favorite distortion, overdrive, fuzz, and boost pedals’ tone. BIAS Distortion Twin integrates with BIAS Pedal’s Tone Match technology – it analyzes and compares your currently selected pedal and the sound of a target tube pedal. It then executes the tonal compensation and enhancements needed to make your pedal’s sound accurately match that of the target pedal. Right out of the box, the BIAS Distortion Twin comes with 9 factory presets simulating tube, germanium, silicon, JFET and MOSFET clipping diodes - you can even mix two diode types together for completely new, unique tones. The four tone shaping knobs (gain, level, tone, and blend) let you really dial in that elusive tone in your head. As if that's not enough, you also get a built-in compressor and noise gate, a booster with boost volume control and three boost types, and your choice of true bypass or buffer bypass. 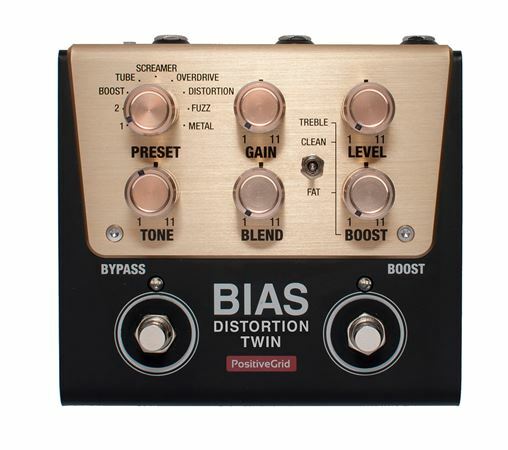 With this much power, the BIAS Distortion Twin may just the most versatile pedal in your rig!